← …I can’t think up a title. 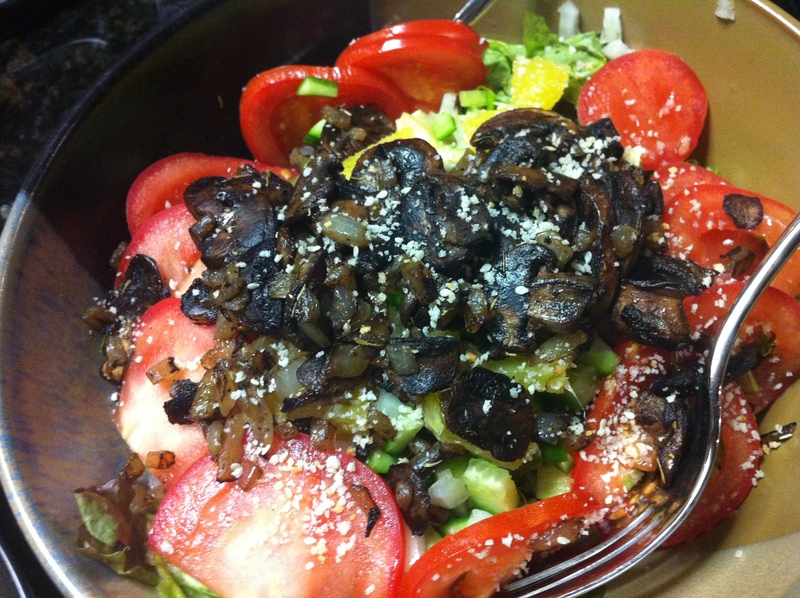 You sauté a bunch of mushrooms together with some onions and casually sprinkle them atop the pile of greens! That and some crispy breadcrumbs. 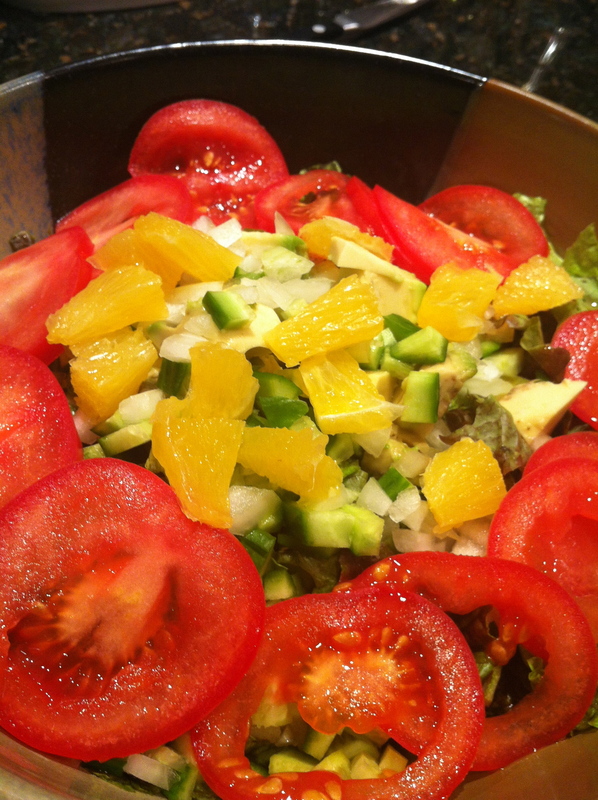 Last night I ROCKED the salad bowl, if I do say so myself. 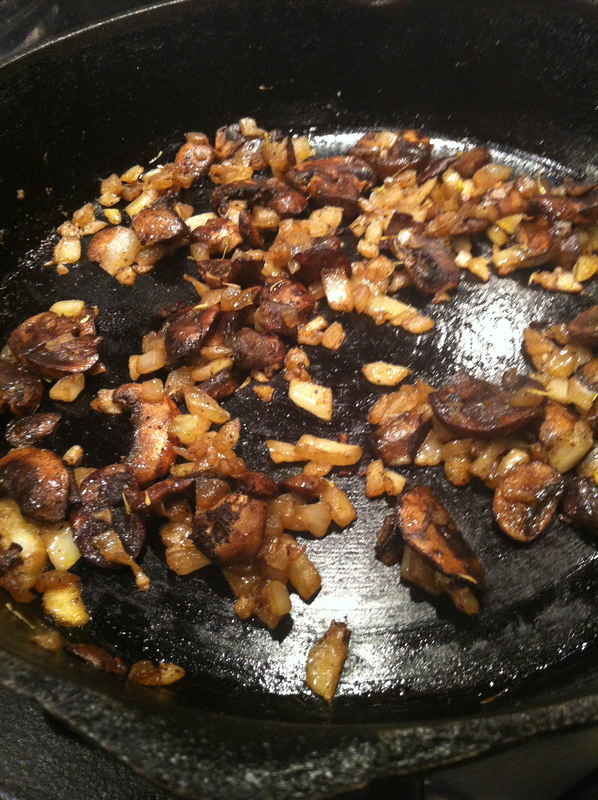 Sautéed Mushrooms make almost everything better! Aromatic Herbs, like Thyme or Rosemary. Fresh is better than dried. 1- I learned from Gabriele on that TV show Extra Virgin that when you cook raw mushrooms you should heat a pan over medium-high heat, then throw in the mushrooms DRY. They need a little room to cook, so don’t crowd the pan. If these means using 2 pans or cooking in batches – so be it. 2- After the mushrooms have released their liquids (a few minutes) you throw in a handful of aromatic herbs and some fat. Once the oil heats or the butter melts, throw in the onions and stir. Lower the heat to medium and let everything sit for a few minutes. 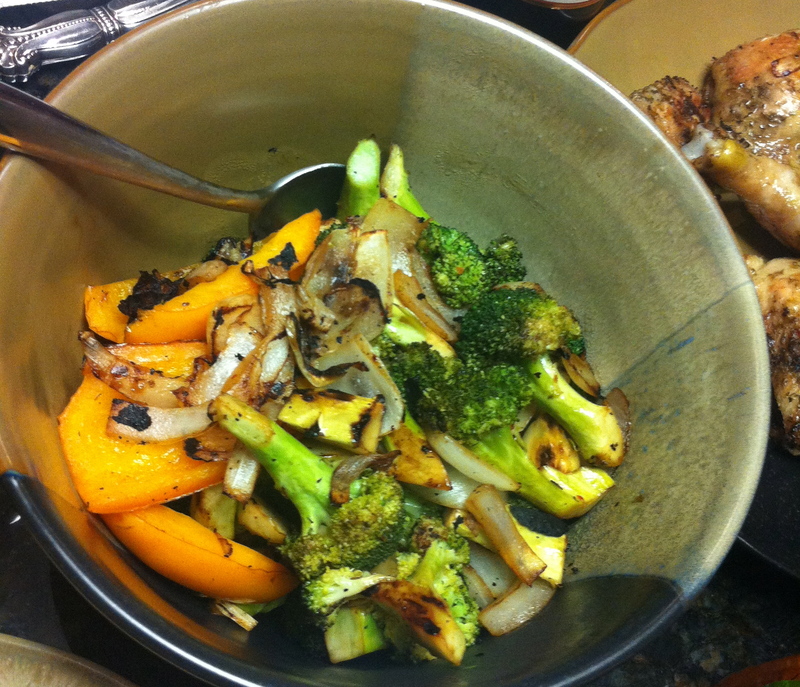 3- Stir, taste, readjust seasoning, then garnish EVERYTHING with these beauties! 1- If you have a grill pan – the kind with the holes in it – use it. If not, use heavy duty aluminum foil. If you don’t have that, use a double or triple layer of the regular stuff. You’re gonna make a foil packet, so leave enough room to wrap around the veg. 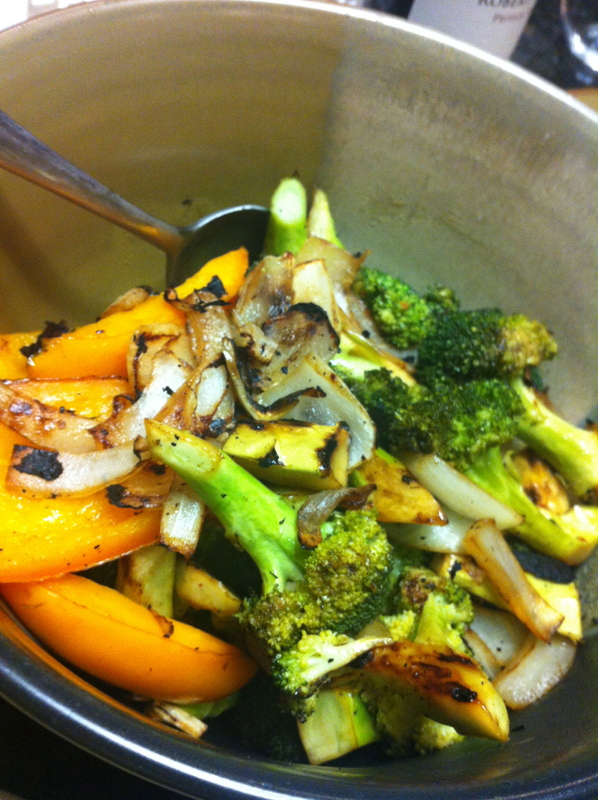 2- Shpritz with Pam/Baking spray and add the veg & garlic. 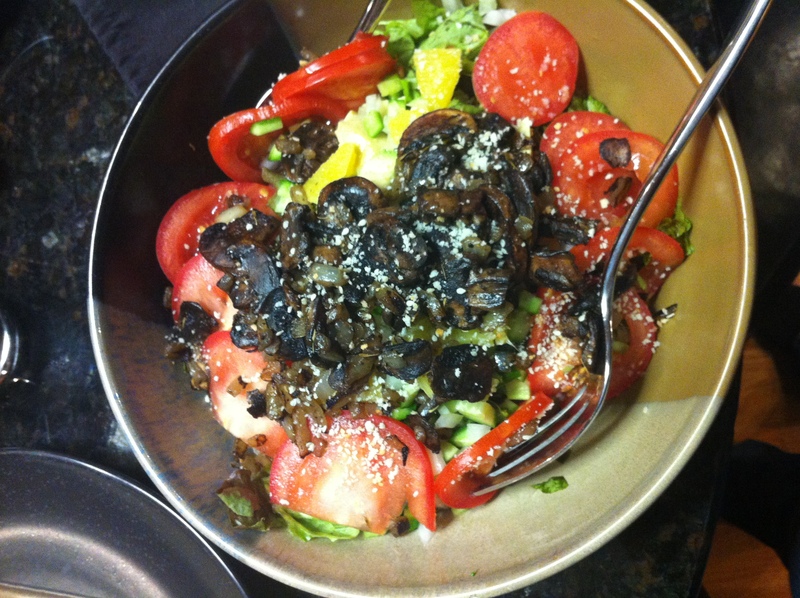 Drizzle the dressing on top and stir a bit to coat. Either top the pan with a sheet of foil or wrap the veg around with the foil. 3- Add to BBQ over indirect heat and let cook for 20 minutes. Enjoy! 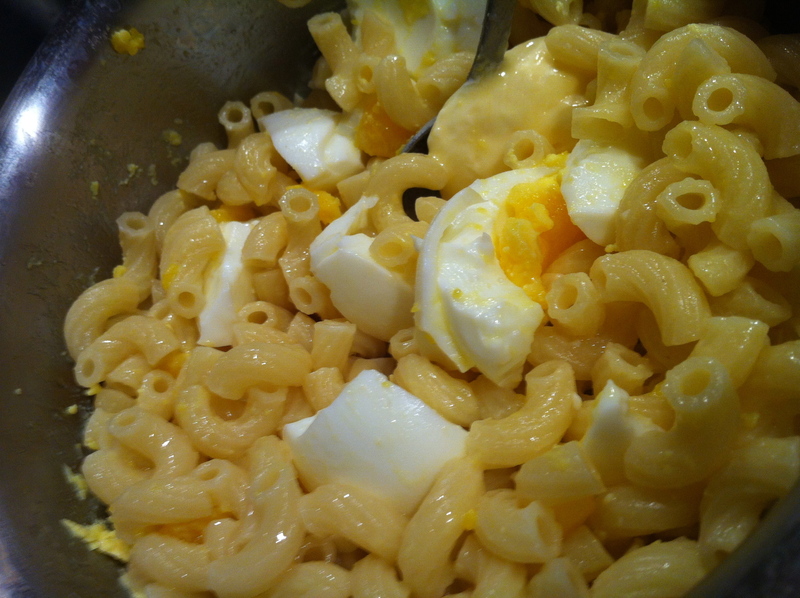 Buttered Noodles + Boiled Eggs = YAY! Pasta **Tonight I used 1/3 box of pasta for me + 2 Toddlers. Use your own judgement to how much you want to use. 1- Bring a medium pan of water up to boil. 2- Add eggs (I use a spoon to lower them into the water) and let sit for a few seconds. 3- Add pasta and stir so the noodles don’t stick. Cook for however long the box says. 4- Drain the pasta and eggs. Return the pasta to the pot and toss with the butter/margarine. Let it sit for a minute so the heat of the noodles melts the butter. In the meantime, de-shell the eggs. I use the side of the fork to sort of mash/cut the eggs into bits in the pot, and then I stir it all together with the buttered noodles. Add salt/pepper to taste if you’d like. Or not. Up to you.